Thermo Fisher Scientific Inc has expanded its portfolio of Thermo Scientific Nunc Roller Bottles for cell culture production. To address the rapid growth and expansion of the global bioproduction market, Nunc Roller Bottles are now available in a wider choice of materials and surface treatments. The new bottles, designed for adherent cell culture applications in the production of vaccines and monoclonal antibody-based biopharmaceuticals, are part of one of the most comprehensive lines of roller bottles in the industry. To achieve optimal cell growth and proliferation, scientists can choose Nunc Roller Bottles constructed of either polyethylene terephthalate (PETG) or polystyrene (PS). Known for rugged durability, Nunc InVitro PETG Roller Bottles withstand freezing and thawing and are available with a smooth internal surface or pleated design for increased cell growth and product yield. 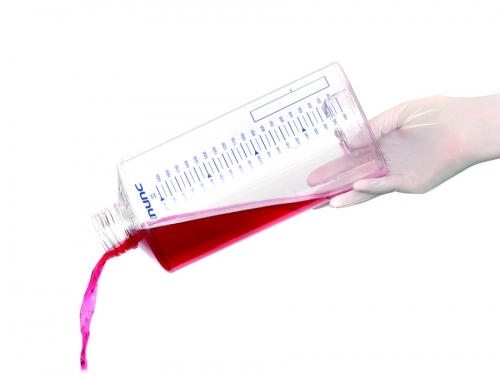 The Nunc TufRol PS Roller Bottles have vertical pleats that are easier to empty and include indentions at the bottom of the bottle for one hand manipulation. Because Nunc T‑flasks and Cell Factory systems are also constructed of polystyrene, TufRol PS Roller Bottles enable scientists to seamlessly develop bioproduction processes, from research to production scale. When ordering bottles, customers can specify their preferred service treatment, including poly-d-lysine for cells that are difficult to grow or vented closures to facilitate gas exchange. All Nunc Roller Bottles are manufactured in facilities that comply with cGMP, ISO 9001:2008 and ISO 13485:2003 quality standards, using polymers that are certified USP Class VI. Products are packaged and shipped in sterile condition and printed with a lot number to ensure traceability.